While Ada Goth’s father, Lord Goth, is away on a cycling book tour, preparations are underway at Ghastly-Gorm Hall for the Full-Moon Fete and Great Ghastly-Gorm Bake Off. In Lord Goth’s absence, Lord Sydney Whimsy has arrived to oversee the arrangements. Everyone is very busy and excited, but Ada is convinced all the busyness will simply make it even more likely that her birthday will once again be overlooked. With a wonderful cast of quirky characters, lots of puns and pop culture references, and several challenges to overcome, Goth Girl and the Fete Worse than Death is a wonderful story for readers looking for something a little bit different. From the named chimney stacks on Ghastly-Gorm Hall’s roof (Snow White and the Seven Dwarfs, Thomas and Jeremy, the Six Chimney Pots of Henry VIII) to the gathering celebrity chefs (Heston Harboil with his Muscovy duck assistant, Nigella Sugarspoon, Gordon Ramgate and more), there are lots of passing references to real-life, historical and literary figures and events. I particularly liked the references to poets and artists and the names for the ovens – The Inferno and Chariot of Fire. Of course, many of these references will go over the heads of younger readers, but this doesn’t diminish the appeal of this entertaining story, as Ada tries to help her nanny reunite with her true love, investigate the suspicious Grocers of the Night, and look into the unusual behaviour of the indoor gamekeeper and outdoor butler Maltravers. Author/illustrator Chris Riddell complements the text with wonderful illustrations of the characters, Ghastly-Gorm Hall decorations, webbed foot notes, and other details that really bring the story to life. 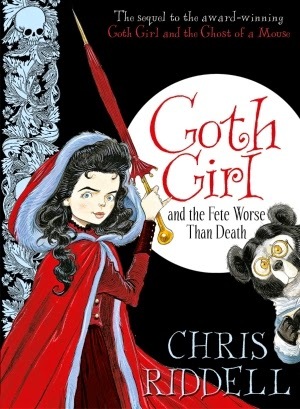 Goth Girl and the Fete Worse than Death is the sequel to Goth Girl and the Ghost of a Mouse. My edition of Fete Worse than Death featured embossed endpapers, pages edged with red, and a ribbon bookmark, which contributed to the atmosphere and visual appeal of the story. There is even a small booklet included at the end with a comic strip biography of Ada's nanny, Marylebone. I haven’t read the first Goth Girl story, but will definitely be tracking down a copy. Goth Girl and the Fete Worse than Death is a fun, outside-the-square story for readers who are interested in books that offer something a little bit different.